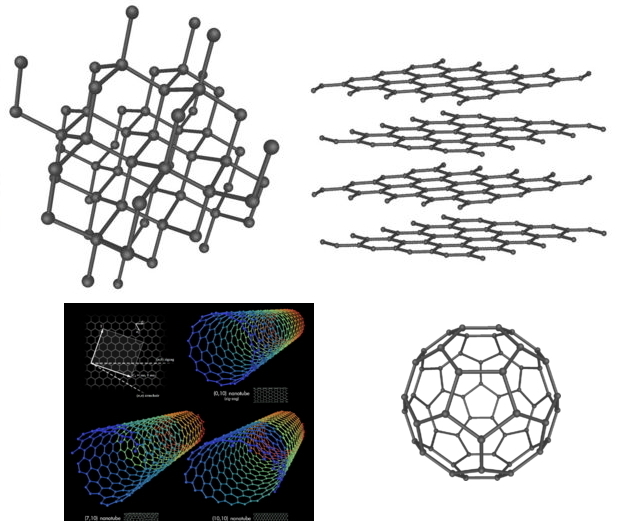 At an early stage in the study of chemistry we learn that there are four general types of crystalline solid and four associated material types: metals, ionic materials like sodium chloride (salts), molecular materials like methane, CH4, and network covalent materials like diamond. Metals can also be modelled using band theory. A metal's thermal and electrical conductivities are proportional, but increasing the temperature increases the thermal conductivity and decreases the electrical conductivity, a behaviour quantified by the Wiedemann-Franz Law, here. From Wikipedia: "The simple classical Drude model provides a very good explanation of DC and AC conductivity in metals, the Hall effect, and thermal conductivity (due to electrons) in metals. The model also explains the Wiedemann-Franz law of 1853. "However, the Drude model greatly overestimates the electronic heat capacities of metals. In reality, metals and insulators have roughly the same heat capacity at room temperature. Although the model can be applied to positive (hole) charge carriers, as demonstrated by the Hall effect, it does not predict their existence." Metals are often ductile and exhibit a huge range of melting points, from mercury, -39°C, to tungsten at 3200°C. Read more in Wikipedia. Ionic materials are insulators as solids, but are electrical conductors when molten and when dissolved in aqueous solution. Ionic materials may dissolve in water (and sometimes in dipolar aprotic solvents such as DMSO), but they are insoluble in non-polar solvents like hexane or chloroform. Ionic binary materials have moderately high melting points, usually in the 300-1000°C range. 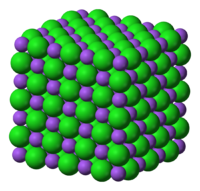 Read more about ionic bonding in Wikipedia. There are several types of van der Waals attraction: dipole/dipole, dipole/induced-dipole and spontaneous-dipole/induced-dipole. It is tempting to consider these forces to be of different strengths, but it is the distance range that is more important. The spontaneous-dipole/induced-dipole attractions  also known as London dispersion forces (LDF)  are surprisingly strong but only act at very short range. These are contact attractions: the surface of even neutral, non-polar molecules like methane are 'sticky'. All molecules have London dispersion forces and the strength increases with the size/surface area of the molecule. This logic is used to explains the increasing boiling and sublimation temperatures of the halogens: F2 < Cl2 < Br2 < I2. Molecular materials may also be hydrogen bonded, where a hydrogen bond involves a proton being shared between two Lewis bases, usually with oxygen, nitrogen or fluorine atomic centres, as discussed here. Molecular materials exhibit a vast array of properties, but they are generally mechanically weak, have zero electrical conductivity, have low melting and boiling points, and/or a susceptibility to sublime. Molecular materials usually soluble in (or miscible with) non-polar solvents. Hydrogen bonded molecular solids are often soluble in water. Network covalent materials are hard, refractory, brittle, usually electrical insulators, and they are not soluble in any solvent. Materials have very high melting points, >1500°C, and are chemically intractable materials. Semiconductors are a sub-set of network covalent materials that conduct electricity, albeit with high resistance when pure. The electrical conductivity, modelled using band theory, can be modified by doping, and this is the basis of the transistor and silicon chip – integrated circuit – technology. Semiconductor elements and binary materials include: silicon, gallium arsinide & indium phosphide. Several elements have pairs of allotropes, one of which is molecular and insulating, and the other which is metalloid: hard, brittle, with a network covalent structure, a metallic lustre and electrical conductivity. These include: carbon (C60 & graphite), tin (gray & white) & arsenic (yellow & grey). William Jensen reports, below, that Grimm and Dehlinger developed an early form of tetrahedron in the nineteen thirties. However, this knowledge appears to have been forgotten. 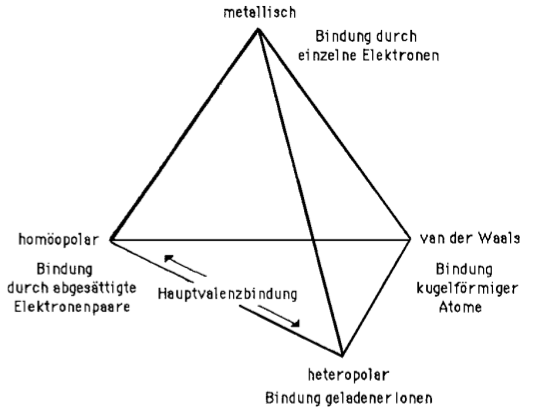 The Grimm Tetrahedron symbolically reflects with the four vertices of a tetrahedron the four main types of bonding in solid chemical compounds: metallic (metallisch), ionic (heteropolar), van der Waals (molecular) & network (homopolar). The six edges between these vertices correspond to the intermediate types of bonds. It is clear that the idea of isolated molecules can be most naturally applied only to one vertex of this diagram (the central one, where the intermolecular interactions are the weak van der Waals forces). From the Concept of Chemical Periodicity: from Mendeleev Table to Molecular Hyper-Periodicity Patterns E. V. Babaev & Ray Hefferlin, here. Discrete molecules, ie molecular materials, are rather easy to model using plastic models and/or computer software because molecular materials are, by definition, of limited size and only consist of a few atoms. Lattice materials – metals, ionic salts & network covalent compounds – are considered to be of infinite size and without surfaces, this is computationally a more difficult task. Indeed, experiment shows that small clusters consisting of hundreds of atoms are required before bulk properties are approached, below. If one wishes to calculate/model a bulk property of a molecular material, such as boiling point, it is necessary to consider a lattice of molecular entities. 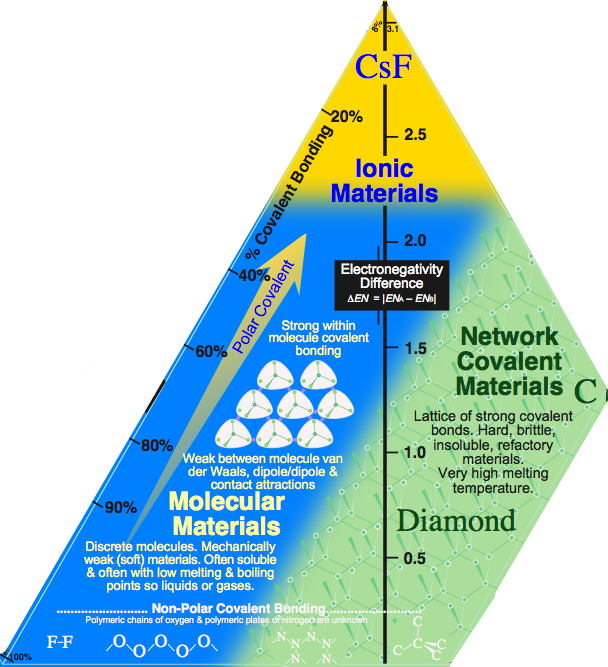 Network covalent materials must, of course, have a surface. The surface does not consist of 'dangling bonds', but can either be oxidised or the surface layer(s) of atoms can rearrange to give a very subtle surface structure. This web page is concerned with bonding and material type, not with crystal type. The science of how atoms, ions and molecules fit together to produce various types of crystallographic unit cell can be explored using resources provided by Oxford University, the University of Hull and Wikipedia. Read more in Stephen Lower's Chem1 Virtual Textbook: States of Matter & Solids. 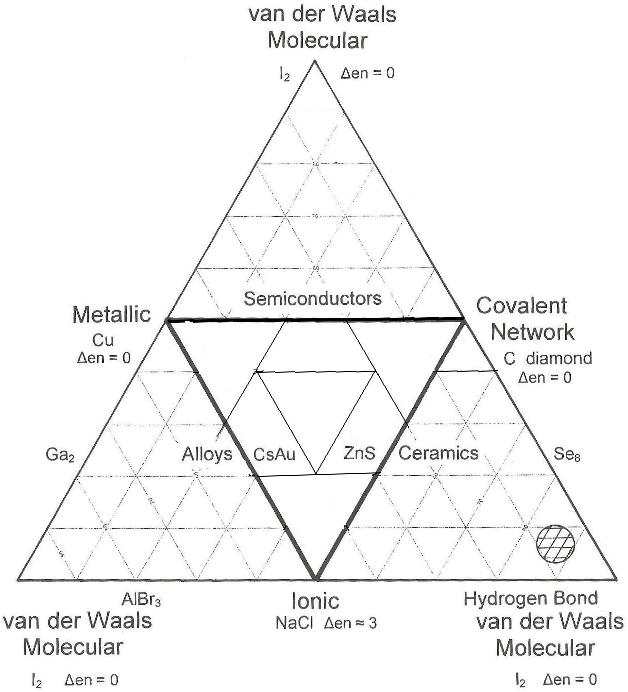 The van Arkel-Ketelaar triangle and the Tetrahedron of structure, bonding & material type are – like the periodic table – visual schemas that map chemical properties to theories of chemical structure. Like all schemas, anyone is free to have a go at choosing representative species and extending/expanding the property sets. 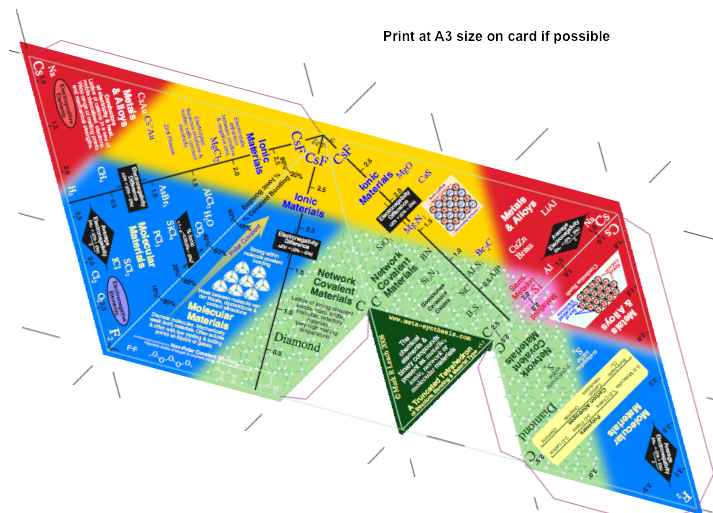 There is still a great deal to discover about the tetrahedron of structure, bonding and material type, and some of this author's ideas – found by standing on the shoulders of Jensen & Laing – follow. In 1995 Jensen showed that it is possible to quantify the van Arkel-Ketelaar Triangle of Bonding by looking at average electronegativity and electronegativity difference: A Quantitative can Arkel Diagram, J.Chem.Educ., 395-398, 72 (1995) and here. 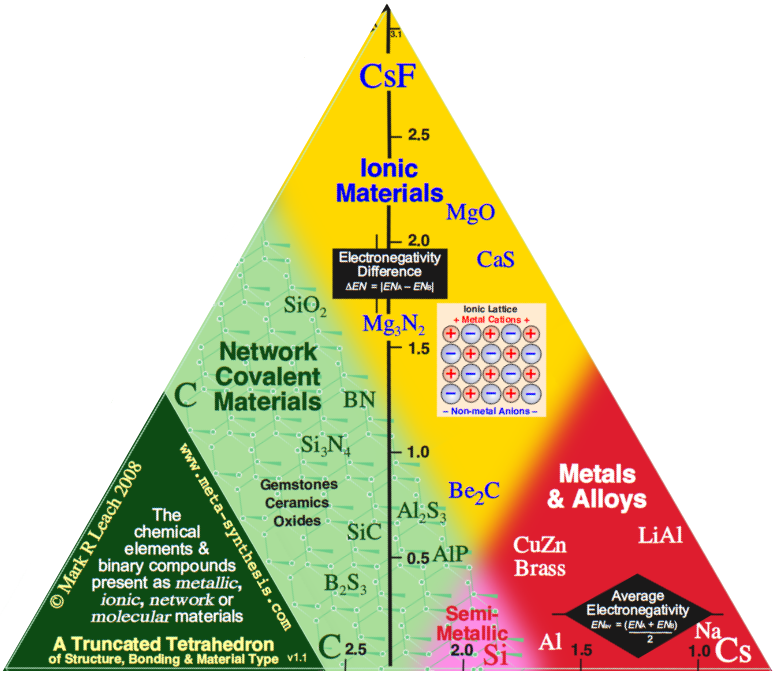 The question is: Can the Tetrahedron of Structure, Bonding and Material Type be quantified? A simple valency rule can be used to predict with good – but admittedly not perfect – accuracy whether a binary compound with covalent bonding will be a molecular or network covalent material. If both of the elements have a common (lower) valency of two or greater and the bonding be covalent the binary compound will likely be a network covalent material: mechanically hard, brittle solid with a high melting temperature that will be insoluble in any solvent. Otherwise, if one or both of the atoms has a common (lower) valency of one: H, Li, Na, K, F, Cl, Br or I, and the bonding be covalent, the binary compound will be molecular material that will be mechanically soft, have a low melting temp (and may even be a liquid or gas) and will be likely to be soluble in either polar or non-polar solvents, but probably not both. CAUTION! This over simple rule does throw up some important errors: CO2, O2 and N2 are predicted to be network covalent materials and therefore solids... where as they are actually molecular gases. 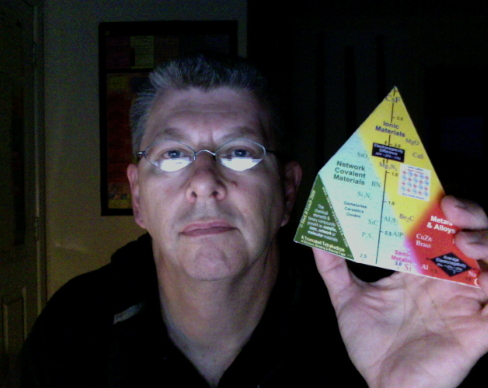 Observation: Three of the corners of the quantitative tetrahedron are clear: Cs, F2 and CsF. Metallic: Cesium, Cs, is a metal and the most electropositive element, 0.79. Molecular: Fluorine is the most electronegative element, 3.98, it is molecular, F2, and the covalent bond is non-polar. Ionic: Cesium fluoride, CsF, is the most ionic binary compound, 3.98 – 0.79 = 3.19. But what about the fourth corner, Network Covalent? 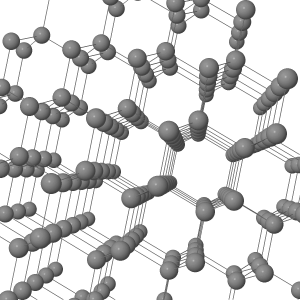 The most electronegative element that forms a network covalent material is carbon, 2.55. It follows that diamond should not be placed at the corner of a tetrahedron at electronegativity 3.98, but at some distance from it, at 2.55. Indeed, the corner of the tetrahedron should be cut off at 2.55, giving a truncated tetrahedron. Unfortunately, the polymeric oxygen and nitrogen allotropes are unknown! 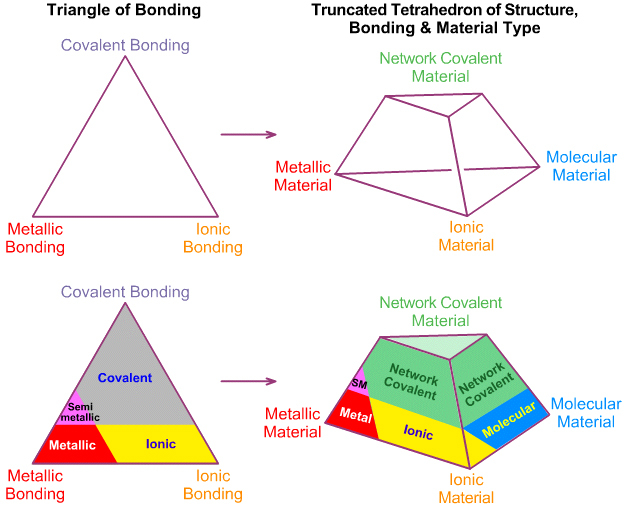 Models & theories of chemical structure & bonding can be mapped onto the Truncated Tetrahedron of Structure, Bonding & Material Type. When metal atoms collect together to form metal, the atomic orbitals overlap form molecular orbitals which range from completely bonding to completely antibonding. These MOs can be separated into conducting and non-conducting bands with as many energy levels as there are electrons. If a material has electrons in the conduction band it will conduct electricity and heat, if there are no electrons in the conducting band it will be an insulator. Semiconductors have a few electrons in the conduction band. Read more in the Wikipedia. It is convenient to think of ionic solids as consisting of a lattice of idealised spheres of definite size and charge, subject only to Coulombic (electrostatic) attraction. Positive cations are attracted to adjacent negative anions, and vice versa. In the simplest models electrons are not shared. Around every cation, a coordination polyhedron of anions forms, in which the cation-anion distance is determined by the radius sums and the coordination number is determined by the radius ratio. The Electrostatic Valence Rule: An ionic structure will be stable to the extent that the sum of the strengths of the electrostatic bonds that reach an anion equals the charge on that anion. The sharing of edges, and particularly faces by two anion polyhedra decreases the stability of a crystal. 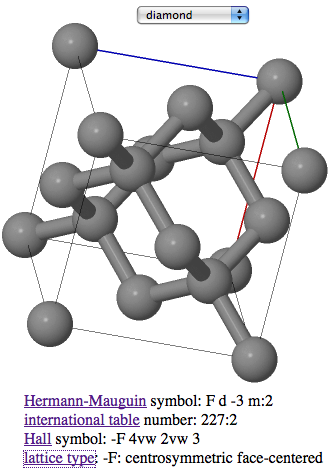 An extension of the third rule: In a crystal which contains different cations, those with high charge and low coordination numbers tend not to share elements of their coordination polyhedra. The Rule of Parsimony The number of essentially different kinds of constituents in a crystal tends to be small. Crystal structures are usually named after a definitive crystal structure, such as: zinc sulfide (structure), sodium chloride, cesium chloride, calcium fluoride (fluorite), rutile, diamond, etc. Molecular and network covalent materials can be modelled in terms of hybridized atomic centres and/or valence shell electron pair repulsion (VSEPR) entities. 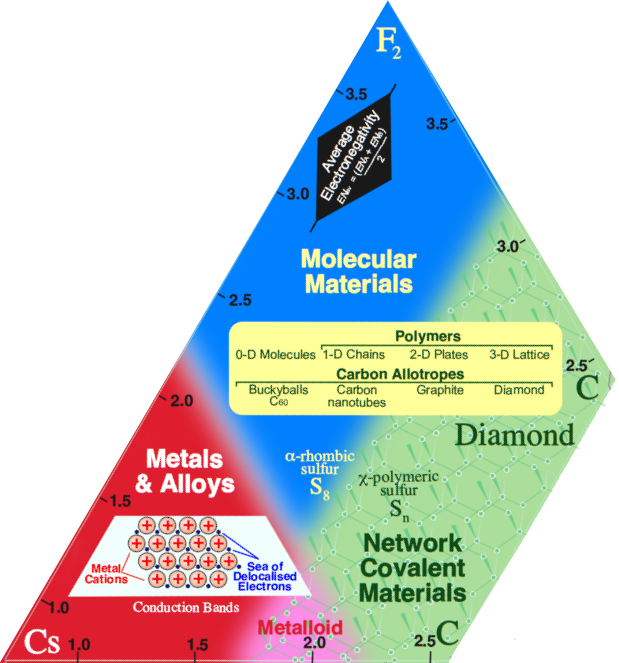 For example, sp3, tetrahedral carbon is found in molecular methane, CH4, and in the extended network covalent of diamond. Molecular structures can be modelled in more detail with (paramertised) molecular mechanics software or with molecular orbital theory. A more detailed discussion of structural theory is available elsewhere in the Chemogenesis web book, here. If an extended network covalent structure is three dimensional, 3d, and plates are two dimensional, 2d, then chains are one dimensional, 1d, and discrete molecules are zero dimensional, 0d, with respect to extended structure, ie at the millimetre scale. Unfortunately, the polymeric oxygen and nitrogen allotropes are not known. C60 buckyballs are zero dimensional, 0d, molecules. C2 is known in the gas phase at high temperature. On the millimetre scale these are point entities. 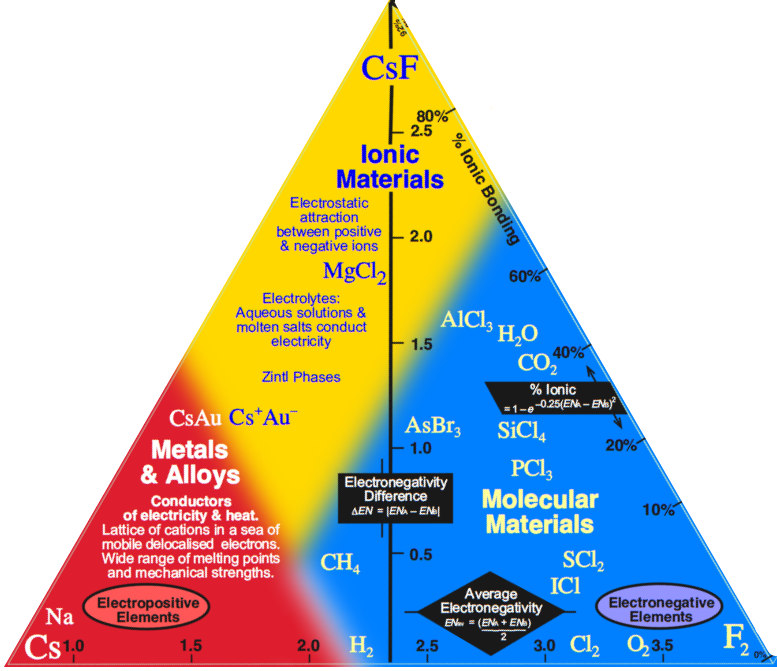 Read a series of reviews about carbon chemistry in Materials Today. Sulfur has zero dimensional and one dimensional allotropes. Above 600°C sulfur exists as S2, a species isoelectronic with O2. At 20°C sulfur exists as the yellow crystalline allotrope Flowers of Sulfur (Brimstone) which consist of S8 rings. Clever chemistry can be used to make ring sizes of 6, 7, 9, 10, 11, 12, 18 & 20. Heating to 160°C causes the S8 rings to open and polymerise. Rapid cooling traps this 1d polymeric state... which slowly turns back into the flowers of sulfur allotrope at room temperature over several days. Polymer chemistry involves converting small monomers, such as ethylene (zero dimensional entities) into one dimensional thermoplastic chains such as low density polyethylene (LDPE), or three dimensionally crosslinked (network covalent) materials like urea-formaldehyde resins. Between the integer 0d, 1d, 2d and 3d dimensions, there are fractional and fractal dimensions. Take a look at the fractal dimension calculator here, and some fractal chemical systems here. Network materials can be ground to fine powders, or synthesized as nano-sized particles. This important because size will strongly influence physical and chemical properties. Like many authors, Laing identifies aluminium chloride, AlCl3, as intermediate between ionic and molecular because aluminium chloride sublimes (as Al2Cl6) so is molecular, but the intramolecular Al-Cl bonds are highly polarised. The difference in electronegativity can be used to calculate the % ionic and % covalent character using the Pauling equation, here. Magnesium chloride, MgCl2, melts to give an ionic liquid that conducts electricity. Aluminium chloride, AlCl3, sublimes to give a gas of dimeric Al2Cl6 then AlCl3 molecular entities. Ionic and polar materials can be ground to fine powders, or synthesized as nano-sized particles that approach molecular sizes. Laing identifies zinc sulfide and zinc selenide, ZnS & ZnSe, as intermediate between ionic and network covalent. While there in nothing wrong with this analysis, it limited because a whole range of commercially important materials are to be found. To consider polar ceramics and oxides it is necessary to identify which part of the tetrahedron we are discussing. For this topic we are not just to looking at Ionic-Network "edge", but the entire Ionic-Network-Molecular face. Ceramics are forming an ever more important part of our lives, but often in unexpected places. In the 1970s there was much talk in the engineering research community about building ceramic internal combustion engines, but the ceramics proved too difficult to work with and the topic is hardly discussed today. However, ceramics are now widely used in modern high performance engines, but they are employed as thin films and coatings rather than as parts. Engines used to be made of low quality cast iron with the pistons running in iron liners. In the 1970s aluminium engines were developed, but they retained their hard wearing iron liners. However, there were problems with the differential thermal expansion of the aluminium engine block and the iron liners that limited performance. Planets, including the Earth, are made from rocks & minerals. Minerals are characterised by having a distinct crystal structure, and there can be exchange between cations, and exchange between anions so that a particular mineral can have a range of compositions. For example, the mineral rhodonite: manganese iron magnesium calcium silicate (Mn, Fe, Mg, Ca)5(SiO3)5, here, can vary in the exact ratio of Mn, Fe, Mg & Ca cations, as long as the net charge adds to 10, so as to counter the 5 silicate ions, [SiO3]2-. Most of the minerals that make up the earth's crust are oxides of silicon, aluminium & iron which give rise to polar network covalent materials which are: high melting point, insulating, insoluble materials. Most rocks  when examined closely  are found be assemblage of two or more minerals. This discontinuity occurs due to the phase change from metallic to network covalent, as illustrated by the alpha and beta allotropes of tin. This phase change is independent of the onset of conductivity as described by band theory. 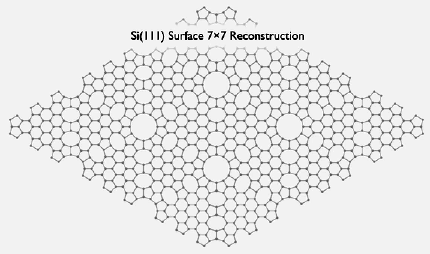 Silicon has an extended network covalent structure: it is hard, brittle, has a high melting point, 1420°C, and is insoluble. However, Si also conducts electricity (albeit slightly) and has a metallic lustre. Ultrapure silicon is actually a poor conductor but its electronic properties can be dramatically modified by doping with small quantities of "impurity" atoms. Substitution of a silicon atom with a phosphorus, arsenic or antimony atom (at the parts per million level) will increase the number of electrons in the conduction band and make the material more conducting. This type of material is classed as an n-doped semiconductor, here. Substitution with boron, aluminium or gallium will reduce the number of electrons so that there are "electron holes". Such materials are classed as p-doped semiconductors, here. When p-doped semiconductors are joined to n-doped semiconductor so that there is a pn-junction, a device is formed which will only allow electricity to flow in one direction. Such a device is called a diode, here. Materials like gallium arsenide, GaAs, and indium antimide, InAs, are isoelectronic with silicon and germanium and are known as III/V semiconductors. Research is being carried out on the doping of diamond to give it semiconductor properties. Laing identifies the digallium molecule, Ga2, as the intermediate between metallic and van der Waals molecular. I argue, as above, that there many intermediates and it is possible to identify and describe the gradual change from metallic to molecular behaviour. "How large does a collection of atoms have to be before it begins to adopt the properties and features of a solid?" The question is answered with reference to metallic clusters. It transpires that when the ionisation energy of mercury clusters is measured there is a gradual transition from essentially atomic behaviour for small clusters (5-10 atoms) to metallic behaviour (60-70 atoms). Thus, it seems that for mercury when a couple of dozen or so atoms bond together, there is sufficient atomic orbital overlap for a conduction band to form and for the material to adopt bulk metallic properties. Copper clusters only adopt the interatomic distance of bulk copper when the cluster size is greater than 10 atoms. Non-metals: Small argon clusters (20-50 atoms) exhibit icosahedral (five fold) symmetry. 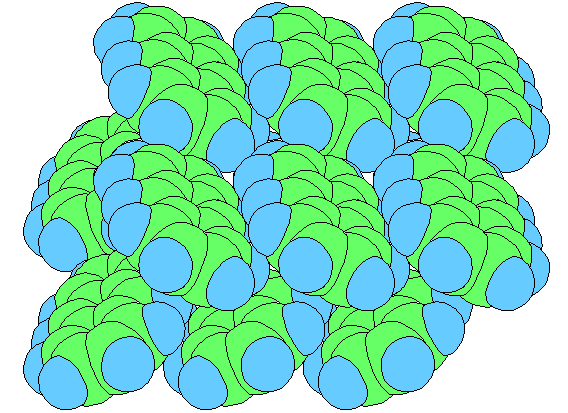 Larger clusters (>100 atoms) and solid argon have a face centred cubic crystalline structure and octahedral symmetry. 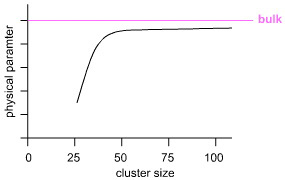 A graph of cluster size vs physical parameter (ionisation energy, interatomic distance, melting point) typically takes the following form with a distinct inflection point between molecular and bulk behaviour. The inflection point varies with element and experimental parameter. 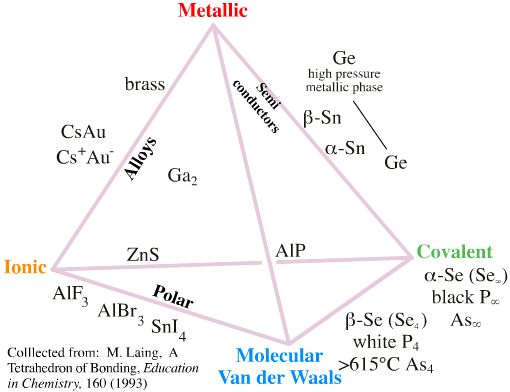 Laing discusses the Metallic-Ionic edge with respect to alloys, particularly the various copper-zinc (brass) alloys that have properties very different to the pure metals, and the cesium-gold intermetallic compound, CsAu or Cs+/Au, which is intermediate between metallic and ionic. Alloying involves mixing of two or more metals to create an entirely new material, e.g. the fusion of copper and tin to make bronze. The mixing is usually carried out by melting a mixture of the solid metals in the desired proportions. However, like water and organic solvents not all molten metals are fully miscible with each other. When a small amount of zinc is added to liquid copper it will dissolve and form a substitutional alloy. However, at >30% zinc, a stoichiometric CuZn phase forms. Lithium is only miscible with sodium above 380°C. It is immiscible with potassium, rubidium and cesium and it does not form substitutional alloys. Lead and copper are immiscible. The earth's core is composed of liquid iron. Elements soluble in liquid iron, called siderophiles, are depleted in the earth's crust compared with the meteorites from which the earth was constructed. It is suggested that the siderophile metals partitioned into the iron core very early in the earth's history. Siderophile metals include: iron, nickel, cobalt, platinum, gold, etc., here. The interesting science occurs when molten mixtures are cooled. There is an excellent introduction by Michael Walshe, University of Limerick. Solid solution alloys form when two metals are totally soluble in both the liquid and solid states. Eutectic alloys form when two metals are soluble in the liquid state but are insoluble in the solid state. The result, when viewed under a microscope, are grain boundaries in the solid alloy which consists of two distinguishable metals. A typical eutectic alloy is formed with cadmium and bismuth. Partial solubility alloys are intermediate between solid solution and eutectic. Intermetallic compounds have a fixed stoichiometric composition. For example, two atoms of magnesium combine with one atom of tin to give Mg2Sn. Likewise, cesium and gold form an intermetallic, CsAu which has properties of Cs+/Au. The intermetallic iron carbide (Fe3C) or cementite is important in the phase diagram of steel, here. Intermetallic compounds are usually hard, brittle have low conductivity. Zintl phases, here and Wikipedia, are valence compounds formed between electropositive metals and main group and post-transition elements. Syntheses are performed in liquid ammonia. Compounds are stoichiometric with salt like structures. In liquid ammonia polyatomic clusters form. Typically, Zintl phases are brittle, coloured and are semiconducting. Alloys and alloy science - metallurgy - can be highly involved. Steel is an iron-carbon alloy, where the carbon is present at up to 7%. Iron can adopt different crystallographic structures, the two most important are austenite (which is FCC and stable at low temperature) and martensite (which is BCC and stable at high temperature). Metals like iron consist of grains, usually microscopic, where each grain is a single crystal. Carbon atoms can either dissolve in the grain or they can collect at the grain boundaries. On heating the carbon atoms migrate or dissolve in the grains of iron. Both the rate of dissolution and the final concentrate increase with temperature. Iron changes its shape when it is bent or hammered. When this happens defects are created in the crystalline grains which result in the metal becoming less ductile. Crucially, the presence of defects obstructs the formation of more defects, so the material becomes more difficult to deform and becomes less ductile. The defects formed by deformation are called dislocations. Increasing the temperature causes the defects to "anneal out" or "heal" because the atoms can migrate. Materials have specific annealing temperatures. Annealing is a kinetically limited process since the atoms most migrate to less energetic binding sites. The higher the temperature the higher the annealing rate. So there are competing processes: deformation produces dislocations and annealing removes them. The activation energy for migration is different in different metals: iron is higher than aluminum or copper. As a result at room temperature, when iron is bent the creation of dislocations is more rapid than the elimination by annealing, so the iron "work-hardens". In copper and aluminum the rate of elimination is greater so the metal does not work harden and break. Of course the situation is complicated by the fact that bending the metal also raises its temperature and hence its annealing rate. Hammering on cold metal hardens it locally (because defects are introduced). Hammering on white-hot iron only changes the shape because the material is above its annealing temperature. Heating the metal serves to dissolve the carbon atoms in the grains. If these carbon atoms remain in the grains when the metal is cooled, they act like defects and harden the metal. If they have time to diffuse back to the grain boundary the metal will remain relatively soft. The key factor here is the rate of temperature change. When a smith plunges white-hot metal into cold water she creates a harder material that will take a hold a sharp edge. Only been in the second half of the 20th century has data been obtained to support models that explain what is happening to carbon at grains and grain boundaries. More information on carbon steels, including the phase diagram, can be found here. On the next page of this web book there is a Binary Material Software Synthlet that predicts bonding and material type from pairs of main-group elements in a semi-quantitative manner. 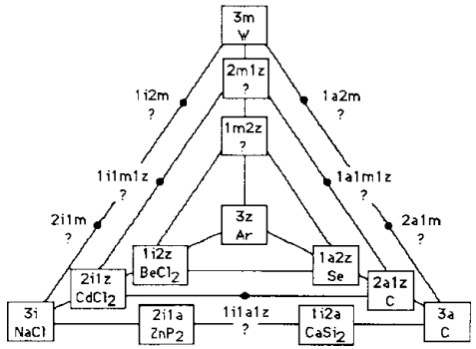 Since writing the 1995 article I have discovered that the first bond-type triangle was actually given by Fernelius and Robey in 1935 rather than by van Arkel and was, in turn, partially anticipated by an even earlier triangle given by Grimm in 1928. Details are found in references 1 and 4 below. Laing is not the originator of the tetrahedral diagram and it should not be named after him. All that he said had been said 60 years before by Grimm and Dehlinger, who in fact had developed a more sophisticated form of the tetrahedron. This tetrahedron was used in several materials science textbooks in the 1950s and 1960s. Details may be found in references 3 and 4 below. 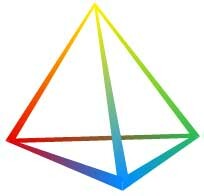 The triangle is a bond type diagram, but the tetrahedron is a structure type diagram. It is important to recognized that these two concepts are not identical. Bond type is only one of several parameters which determine overall structure type. The differences between the two types of diagram are discussed in references 3 and 4 below. W. B. Jensen, "The Historical Development of the van Arkel Bond-Type Triangle," Bull. Hist, Chem, 1992-1993, 13-14, 47-59. W. B. Jensen, "Bond Type versus Structure Type," Educ. Chem, 1994, 31, 94. W. B. Jensen, "Logic, History and the Chemistry Textbook II: Can We Unmuddle the Chemistry Textbook?," J. Chem. Educ., 1998, 75, 817-828. A number of changes have been made to the text on this page as a result of Bill Jensen's communication, particularly the point about triangles of bonding but tetrahedra of structure bonding & material type.